Charming and loaded with curb appeal best describes this 8 room Colonial home located just minutes from Horn Pond. This warm & inviting home features generous living room that opens into additional sunny & heated room with beamed ceiling, (would make a great playroom, den or office). The large appliance kitchen has plenty of cabinets, counter space and center island for all you cooking needs. The sunny formal dining room is complete with Chandelier and wrap around plate rail. The second floor has open & spacious hallway with full bath, linen closet & all 3 bedrooms have ceiling fans. Basement is partially finished with laundry area and separate room for additional storage. Detached garage has unique space above it. Side staircase leads deck like area where seller had patio furniture & grill. Roof has been updated & home does need some TLC, but is loaded with natural wood & hardwood floors throughout. 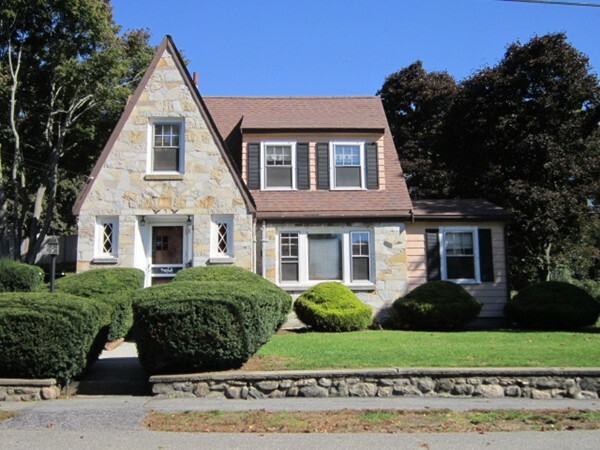 Close to transportation, highways & approx 1/2 mile to downtown Woburn!